Mistletoe is an ancient plant that has intrigued us for centuries. It was often thought to have magical properties and right up to modern times, has been used as a folk remedy for various conditions. Mistletoe extract has recently been used successfully as a treatment for colon cancer, so maybe our forebears knew more than we thought. Of, course mistletoe also has a reputation for being an aphrodisiac which is why it is brought into the house at Christmas for us to kiss beneath it. However, mistletoe should not be eaten except under medical supervision as the plant contains toxins. The plant is smothered with white, waxy berries in winter and spring and can be seen throughout winter as an evergreen ball of foliage among the bare branches of the tree. Mistletoe is unusual because it does not grow in the soil. It develops on the branches of trees such as apple, crab apple, lime, black poplar, hawthorn and willow. It is a semi-parasitic plant that lives by taking nutrients and water from its host. It does, however, provide some of its own nutrients through photosynthesis. If kept under control it will not cause much harm to the host, however, too much mistletoe can weaken and even kill the tree. You may be lucky enough to have mistletoe in your garden as the birds spread the seeds from one tree to another. However, if you do not have the plant already you can grow it as long as you have a host tree that is suitable. Mistletoe grows wild in many parts of the UK but is especially prevalent in the south west midlands and Herefordshire. The most common host tree is apple, but it can often be found on poplar and lime. Mistletoe has recently been recognised as a keystone species. This means it has a beneficial impact on the environment. Mistletoe is an important source of food for birds such as the blackcap and some mammals that eat its berries and leaves. It is also important as a nesting site for birds and small mammals. Mistletoe is particularly important for the Mistle Thrush which is under threat in the UK. The plant also supports the rare mistletoe marble moth and the mistletoe weevil. To grow mistletoe in your garden, you will need a suitable host tree that is at least fifteen years old. Mistletoe is a plant that is associated with many myths and was considered sacred by the Druids and the Romans. There are also many myths associated with growing mistletoe. These include that the seed must pass through a bird before growing. Luckily this isn’t true. The following directions will guide you on how to grow your own mistletoe. These instructions refer to the European variety Viscum album. You should bear in mind that mistletoe is a semi-parasitic plant and will need some management so that it does not harm your tree. You will also find that fruit trees will produce less fruit on branches that are hosts to mistletoe. However, with good management, you will be able to get a good balance between caring for the host tree and allowing mistletoe to thrive. 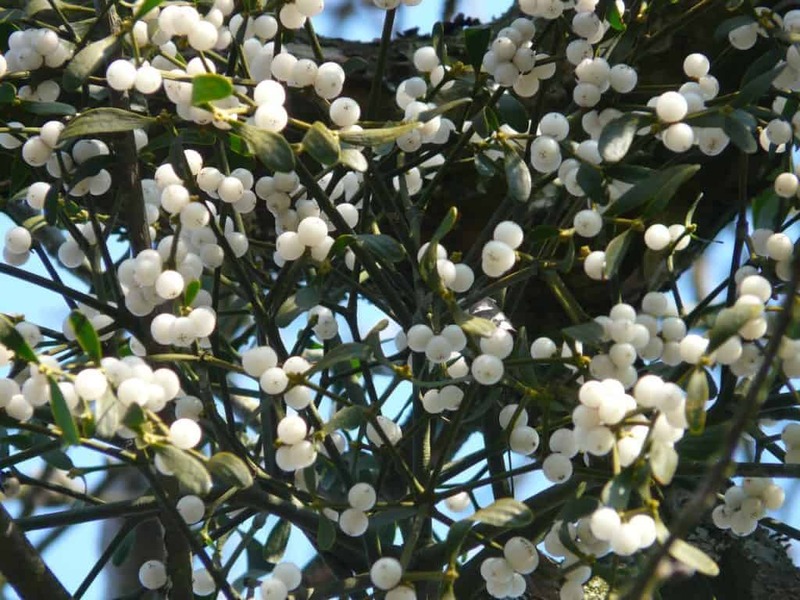 Mistletoe plants need plenty of light, so you should spread the seeds as high as possible in the tree. Your mistletoe will get its water requirements from the host tree. However, the host tree may need some additional water in times of drought. It will also appreciate a mulch to help it retain moisture. Mistletoe does not require soil to grow. Your plant will get its nutrients from the host tree and by photosynthesizing. However, the host tree may benefit from some additional fertilizer to help it cope with its guest. Apply a slow release fertilizer in spring. Your mistletoe can be sown in the branches of many trees including apple, lime, hawthorn, poplar, maple, willow, crab apple and false acacia (Robinia). The full list of species that mistletoe will grow on runs into many hundreds. You can grow mistletoe on apple trees in your garden quite easily and they will be happy even in dwarf trees but will need to be managed so that the balance between tree and host is met. Mistletoe likes plenty of light and so will grow best on trees in gardens, orchard, parkland and churchyards. Trees in woodlands generally do not get enough light for the plant to grow well. The best time to sow mistletoe is February or March. Ideally, you should harvest fresh berries around this time. If you have an existing mistletoe plant, you can harvest berries from this, otherwise, ask someone who has a plant if you can harvest some from them. If you do not know anyone who has mistletoe you can buy the plants online. Make sure the plants you buy are freshly harvested. The berries should be plump, not dry and withered and the foliage should look fresh and green. The berries should also be white. Green berries are not mature. It is not necessary for the mistletoe to have been growing in the same species tree as you plant to grow yours. The mistletoe will grow in any suitable host tree. It is not usually worth trying to germinate seeds from mistletoe sprigs bought as Christmas decorations as these are often harvested before they are mature and dry out in the heated indoor atmosphere over Christmas. You can keep the mistletoe for up to three weeks in a cool place before using. Do not keep them in the dark, or in a fridge. The seeds will die without light! To propagate your mistletoe, you will need to choose suitable branches that are quite young and around 5-10 cm in diameter. Choose branches that are fairly high as these will get more light. If the plants have been stored for a while put them in some water for several hours so that they rehydrate. Discard any berries that are already split or crushed. Take your fresh or rehydrated berries and squeeze out the seeds. They will come out in a jelly-like substance called viscin. You can remove most of this but leave just enough that the seeds have something to stick with. Some sources advise cutting a flap in the bark under which to insert the seeds. However, this is usually unnecessary and inadvisable as it can damage the tree and allow diseases, pests and fungi to get in. Anyway, mistletoe seeds need healthy host bark and plenty of light to grow. Mistletoe seeds are very sticky and will easily attach to the bark of the host tree. You may like to put some netting over the seeds to protect them from birds. You should plant about twenty seeds, spread across four branches. Not all the seeds will germinate, and some may be lost to birds or insects. Planting more seeds also increases the likelihood of propagating both male and female plants, which is necessary if the plants are to produce berries. Label the branches you have put your seeds on as the seedlings can be difficult to find. When your seed germinates it will produce a hypocotyl which will bend towards the bark of the host tree. Once it has made contact with the bark it will flatten and attach itself to the bark like a sucker. The seedling then penetrates the host tree and create a haustorium. The haustorium enables the plant to penetrate the tissue of the tree and absorb nutrients from it. You will see a swelling on the tree branch at the place the mistletoe has penetrated. Mistletoe is initially slow growing. For the first two years, you may see barely any growth and may even think your mistletoe has disappeared as it becomes camouflaged with algae. If your seedling has died it will turn yellow and shrivel away. After the first year, your seedlings may well still be very tiny. However, they should be greener and more upright by now. By the third year, you should see some proper leaves. After this, the plant will begin to grow more quickly, doubling its branches at least once a year. It may take five years for a plant on an apple tree to grow berries and even longer on some other host trees. If your plant produces flowers but no berries it is a male plant. If this happens, insert some more seeds on other branches to increase the likelihood of producing a female plant to complement your male. Mistletoe berries contain potential toxins, so they should be kept away from pets and children. In large trees, mistletoe can often be left to itself. However, in small trees, some management is required to make sure the mistletoe does not overwhelm its host. It’s is best to prune your plant in winter when the host tree’s branches are bare, and the mistletoe can be easily seen. In general, it is wise to cut back one-third of mistletoe growth on smaller trees each year. In addition, any heavily infested branches may need some of the plants removed. You can also rub off any new seedlings that are growing in places where they are not wanted. Many people make the mistake of harvesting the female plants for decoration at Christmas time and leaving the male plants untouched. This can mean that over time they become too large. It is best to cut back the male and female plants equally. Mistletoe will affect the vigour of your tree, so you want to ensure that some branches are left free of the plant. The tree branches that have mistletoe will have a swelling where the haustorium has grown. This can lead to the rest of the branch becoming distorted or dying off. This means that this branch will no longer be serving the tree. Obviously, if this happens to all the branches the tree will struggle to survive. In addition, mistletoe can make your tree more susceptible to wind damage. In winter, your deciduous tree will shed its leaves and be less affected by winter storms. The mistletoe will create resistance and may lead to damage in winter weather. This is another reason for keeping the plants small, especially in smaller, younger trees. Failure to maintain a good balance between mistletoe and the host tree will mean the death of both the tree and the mistletoe. Mistletoe is not affected by any known pests and diseases. Q My mistletoe plant has lots of flowers but no berries. How can I get my plant to produce lovely white berries for Christmas? If your plant is only producing flowers it is most likely a male plant. You should plant lots of seeds so that hopefully you will get a female plant, too and, then you will see the beautiful white berries. Q I’ve heard that mistletoe kills trees. Should I get rid of the mistletoe growing on my apple tree? It is unlikely that mistletoe will kill your tree unless it is completely smothered. However, mistletoe can weaken the tree a little as it takes some minerals and water from its host. You may see less fruit on branches that are hosting mistletoe plants. If you like the mistletoe and are not worried about losing a few apples, then, by all means, keep this lovely plant. Limit the amount of mistletoe growth and prune back the plants by a third to ensure it does not overwhelm your tree. Then, give your tree some extra fertilizer and water to help it cope and it should be fine.